Adidas, Unilver and Medtronic provide investors with firepower and lots of global revenue. Looking for a solid investment with good technicals right now? Look no further. The Dynamic Alpha Brands Index was designed to track the most relevant, recognizable and technically superior international and domestic brands from the perspective of the average U.S. consumer. Many of the iconic brands we love also have a global footprint. In fact, in the current 50 stock March portfolio, about 46% of the brands derive at least 40% of their revenue from outside the United States. For a brand to make it into the top 200 universe, it must have products or services that have global, not just domestic, appeal. Even if the company's revenue is mostly domestic, it should be scaleable for a global consumer. The German athletic wear and gear company's brands include Adams Golf, Adidas, Ashworth, CCM Brands, Five Ten, Reebok, Samba, Stan Smith and Taylor Made. With gross margins of about 48%, Adidas beats even Nike. Top-line momentum in most regions was solid last quarter: up 16% in Greater China, 12% in Latin America, 8% in North America and 30% in Western Europe. 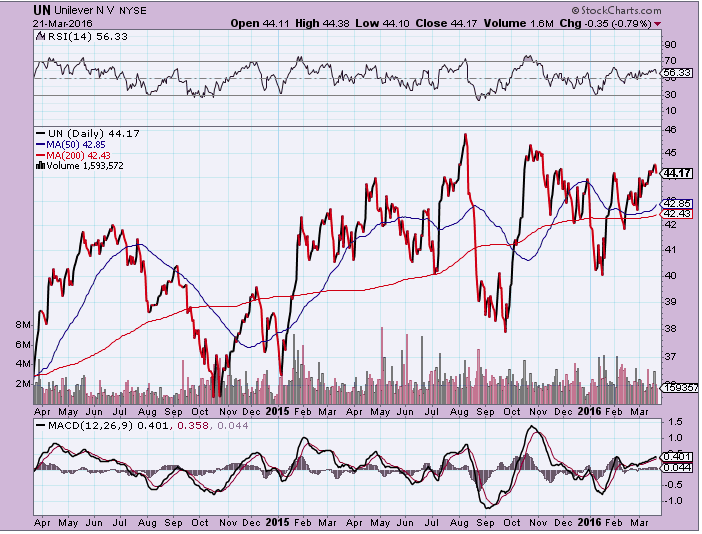 Technically, the stock looks terrific, albeit a bit overbought. 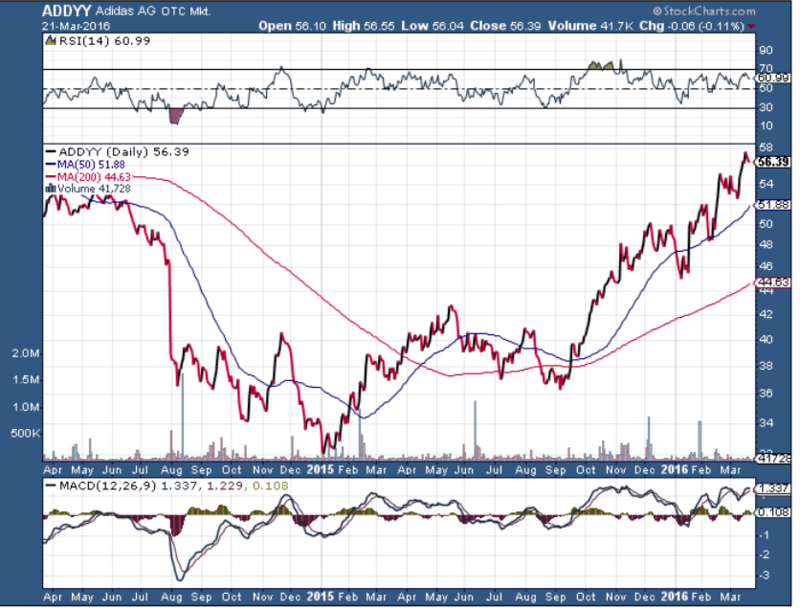 Although, rivals Nike and Under Armour also have solid brands, Adidas' stock has been the clear winner over the past 12 months. This Dutch consumer company's brands include Ben & Jerry's, Breyers Ice Cream, Degree, Dermalogica, Dove, Hellman's Foods, Lady's Choice, Liptons, Noxima, Popsicle, Q-Tips, Talenti and Vaseline. The technical picture for Unilever's stock is up and to the right, just the way we like them. After the recent acquisition of Covidien, the Irish medical device company's stock is trading at about 17 times forward earnings. Medtronic is a dividend aristocrat, meaning that it has paid and raised its dividend year after year, for 38 years, in fact. Management recently reiterated its commitment to return a large portion of the company's free cash flow in the form of dividends and share repurchases. The company is highly diversified and well-run in an important industry, given an aging global society. 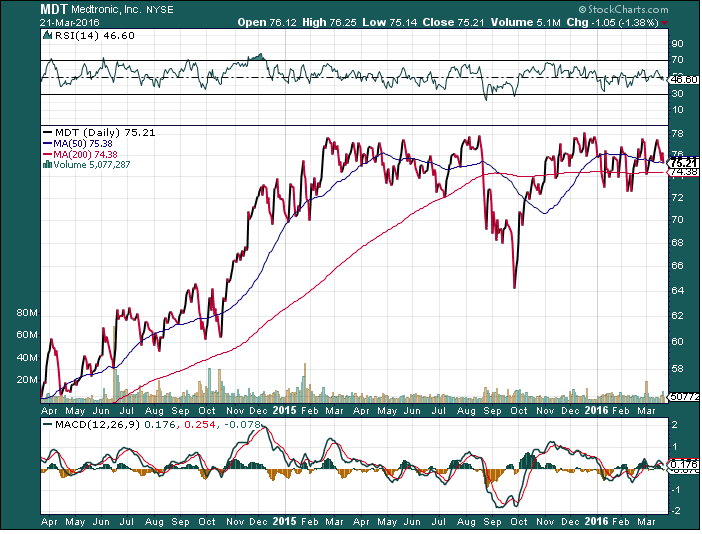 The technical picture for Medtronic's stock looks like we are building a nice bottoming pattern. A move over $78 could mean explosive move to $100 over time.